Playing in Coors Field is like playing no where else in major league baseball. 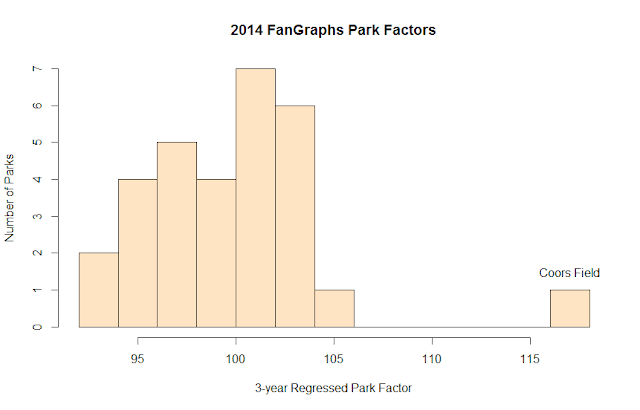 It's just a different game altogether, and none of the other parks can really compare in terms of how much of an affect the park has on a baseball game. Whether it's due to their park, poor personnel decisions, or bad luck, or whatever else, the Rockies haven't had a winning season since 2010 when they rode Ubaldo Jiminez, Carlos Gonzalez, and Troy Tulowitzki to a third-place finish. The year before, they made the playoffs with much the same squad (plus Jason Marquis). And it sort of feels like they're still trying to ride that same squad today. Ubaldo is no longer with them, of course, and unfortunately CarGo and Tulo no longer seem to be the great players they once were. There are some new faces and names, but the Rockies never seem to be able to avoid cratering at a position or two, and always have a hard time piecing together a rotation. The same is definitely true this year. By pretty much every measure in every category, the Reds have been equal to or marginally better than the Rockies. 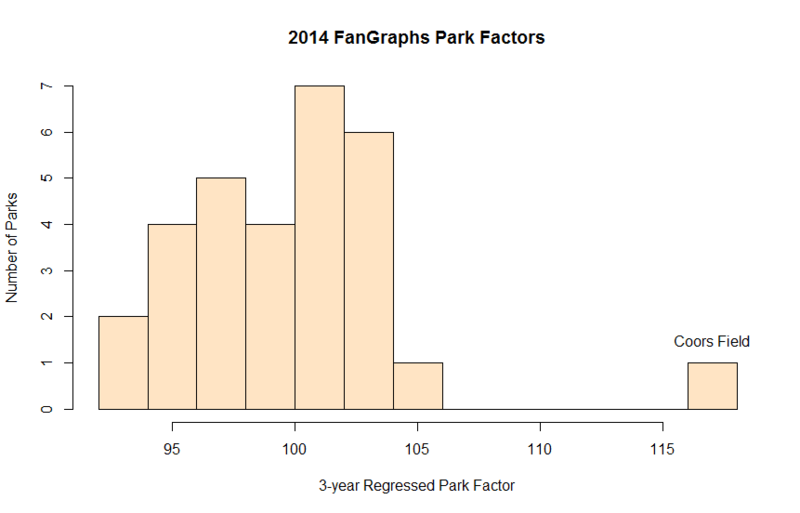 They've hit slightly better (after park adjustments), their rotation has been slightly better, while their bullpens and fielding have more or less been a wash. Neither team is in line to make any sort of push for the playoffs, and both are expected to be sellers at the trade deadline. The question is which players they will be able move. Prior to this season, the question with Troy Tulowitzki has always been whether he can stay on the field. Last year, he posted 5.3 WAR in just 375 plate appearances. After having surgery to repair a hip labrum tear(*) that he'd been dealing with since 2008, he is back and supposedly healthy this year. However, he got off to an unbelievably bad start this season. He suddenly and inexplicably stopped walking altogether, wasn't compensating in other ways, and was generally awful. Over the past month-plus, however, he seemed to have turned the corner, with career-normal walk rates and a 41-game on-base streak. He might be back. I'm hoping; he's always been one of my favorites. * Note: sounds like the same injury that afflicted Devin Mesoraco this year. Nolan Arenado has become one of the leading figures on this team as CarGo has slipped and Tulo has been hurt. He hits well and fields brilliantly. Not much else that one can ask for. The other guy of particular note is former Cistulli-crush Charlie Blackmon, who is a significant force in the Rockies outfield...at least against right-handers. The wrap on him is that he can't hit lefties, although his career L/R splits don't seem that ridiculous (82 wRC+ v. LHP, 105 v. RHP...though they've been particularly pronounced this year at 60/133). Drew Stubbs is still a Rockie. He gets starts against lefties, but as such probably will not appear this series except as a substitute. Reds notes: Good to see Jay Bruce turn it on over this past month. I've enjoyed watching Eugenio Suarez as well, though he's been a little BABIP-y, isn't walking, and has higher strikeouts then you'd like to see. The power (.182 ISO for a SS), at least, has been encouraging. 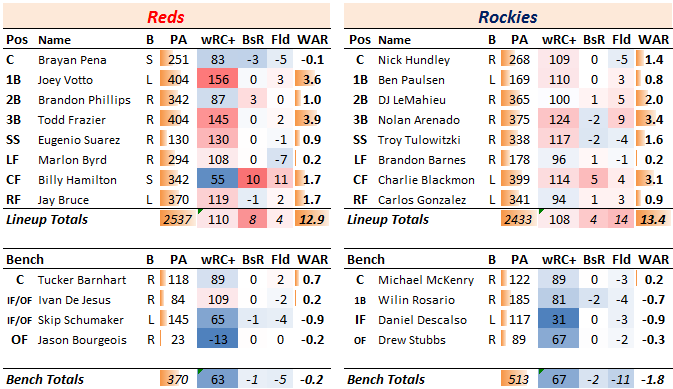 Joey Votto's wRC+ finally crept over Todd Frazier's on the season with Votto's recent non-elite surge. The one rookie of any note on the Rockies right now is first-game starter Eddie Butler. Kiley McDaniel ranked him as the #42 prospect in baseball, with good velocity and a good change-up. His ground ball rate has been impressive, but he's walked more than he's struck out so far this year. Former Cubs swingman Chris Rusin has been doing a credible left-handed Mike Leake impersonation this year, and has had the best season of this Rockies' trio. Kyle Kendrick is not very good, but throws strikes. The big thing for the Reds this series is to see Cueto have a good game with good control. Pitching in Colorado isn't going to help, but he needs to demonstrate that his loss of control in his last start was just a hiccup. The Reds should have traded him a few weeks ago, or so I thought. But they are content to wait for the offers to improve and hope he doesn't break. .... this, by the way, is why I don't handle any negotiations at my house. I just want to have this over and done with, before something happens that kills all of his value. The Rockies have some good pieces. I love that LaTroy Hawkins is still a credible reliever, and is wearing purple again. 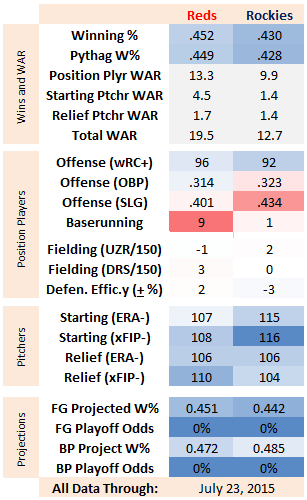 John Axford has done well as a closer, but he's never a sure thing. Top lefty Boone Logan has been vulnerable. And hurrah for Jumbo Diaz's return! I predict a nice second-half for him, and a fairly steady ascent back into a late-inning role.